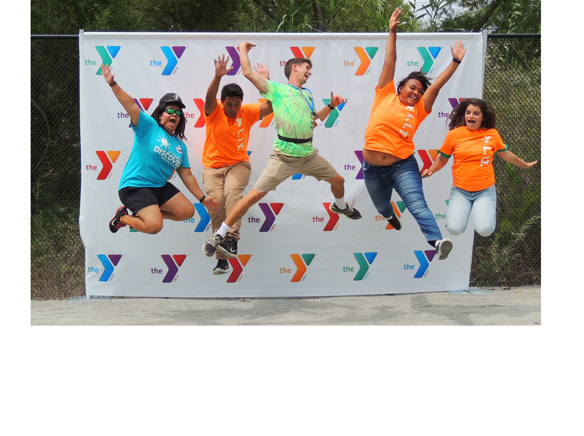 Unforgettable memories are made at camp, and the grand opening of Camp McGrath at the McGrath Family YMCA in Rancho San Diego made for more great ones. Hamburgers and hot dogs were the menu of the day under colorful canopies of the Center for Oral and Facial Surgery Picnic Area. YMCA Camp McGrath, a camp-style recreation area, is the newest addition to this YMCA at 12006 Campo Road. The Thompson Family Rock Climbing Wall, standing at more than 50 feet high, towers above the canopies. A large octagon court named the GaGa Pit will be the place for different kinds of ball games. The tall green leafy trees waving in the breezes above the Sweetwater River enhances the outdoor camp environment. Anne Pooch, a resident of the area, felt proud to have such a facility in her neighborhood. She uses the YMCA facility for its Active Adult classes. “This is a great new camp. I’ve donated a little to it. I believe in giving back to the community,” Pooch said. The opening day picnic was just the first of a slew of activities and events planned for kids at Camp McGrath, from campfires and contests to sing-alongs and sleepovers. Chris Coughlin, board chair of the YMCA, invited everyone to come sit under the shade of the Page Pavilion. “These kinds of parks are what make our communities great,” Coughlin said to the crowd of 100 gathered. “It will be a place the kids call home,” said Alicia Brown, one of the camp leaders. Rob Sauvajot, regional vice president, agreed. “When I came out here early this morning with Chase Wiegand, our camp director, singing with all the kids, it reminded me of why we created this place,” he said. Board member Roy Thompson agreed. “It’s not about us. It’s about the kids,” he said. A breeze sifted among the people seated under the pavilion. “That feels good, doesn’t it?” Steve Rowe said at the podium. Rowe is the chief operating officer of San Diego County YMCA. “This is the first Y Camp in the city. It’s great to get the kids outside with their families doing things. Great job, East County!” said Rowe. Tom Page, a naming donor to the Camp, said that after his wife had passed on, he and the family were looking for a project to support in her memory. “Evelyn loved to swim in the pool here, so we helped with the upper level buildout and the pavilion you are sitting under. And we must all thank the McGrath family, for Laurie and Carlee’s donations to this great facility,” Page said to the applause of everyone. In addition to the new Camp McGrath, this YMCA includes a state-of-the-art sports complex, a 35,000 sq. ft. full-service facility with the Sycuan Wellness/Fitness Center, the Dallas Pugh Gymnasium, a Youth and Teen Development Center and multiple Group Exercise Studios. The YMCA also includes a Member Lounge and Child Watch Center. McGrath Family YMCA is part of the East County Family YMCA, including the John A. Davis Family YMCA in La Mesa and the Cameron Family YMCA in Santee. For more information about McGrath Family YMCA, go to www.eastcounty.ymca.org.